According to Jane's IHS, several contenders are in the run for the Challenger 2 LEP upgrade contract. The Challenger 2 life extension programme (LEP) was announced some time after the reveal of the T-14 Armata tank in Russia during the Moscow Victory Day Parade 2015. At first the UK MoD also considered buying a completely new main battle tank (MBT) as replacement of the Challenger 2. In particular the lethality and the effectivity of the L30A1 tank gun has been questioned. Unlike other tanks such as the M1 Abrams and the Leopard 2 MBTs, the Challenger 2 has not seen any major upgrades since it's introduction into British Army service in the 1990s. The British Army already investigated the replacement of the rifled L30 gun with a German Rh 120 L/55 smoothbore gun during the Challenger 2 lethality improvment programme (CLIP) beginning in 2001, but this project was terminated due to too high costs. The German gun together with the superior tungsten ammunition proved to be more effective during the British trials. The follow-up to CLIP was the Challenger 2 capability sustainment programme (C2 CSP), which incorporated most parts of the CLIP and some new upgrade ideas. However the C2 CSP also ended up being too expensive and was thus terminated in 2008. The Challenger 2 LEP was announced in July 2013 and started one year later. The reveal of the T-14 Armata however triggered however the UK's interest in owning a tank strong enough to cope with the T-14. The Challenger 2E is the most advanced version of the CR2 to be developed by Vickers/BAE yet. The list of contenders is rather interesting. BAE as owner of Vickers has the in-house advantage, but has not gathered any experience in modern tank design/building since the Challenger 2. Even worse BAE had to rely on the purchased Hägglunds for any sort of the success on the AFV export market in the recent history. 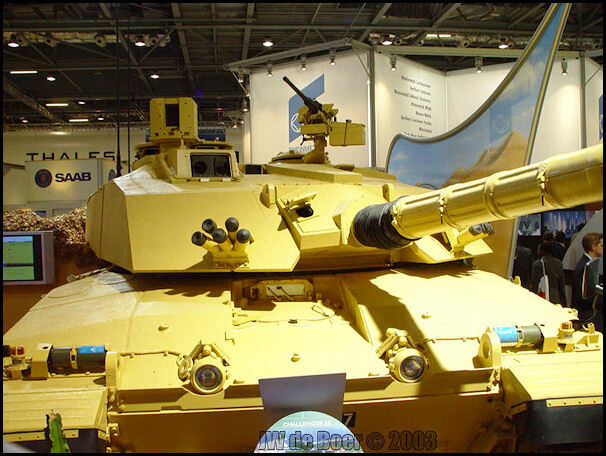 In theory BAE might fall back to the old Vickers Challenger 2E tank designed for export, which failed to perform equally well as the Leopard 2, Leclerc and M1 Abrams in the Greek trials in the early-2000s. The Challenger 2E offers a number of considerable upgrades over the current CR2: a EuroPowerPack (MTU MT883 engine together with Renk HSWL 295TM transmission) and a new, superior fire control system with the SAGEM MVS 580 periscope and SAGEM SAVAN 15 gunner's sight. However BAE announced in 2005 that the development of the CR2E was stopped following lack of success on the export market. General Dynamics is having the Abrams as up-to-date modernized MBT. While the upgrades might not be as deep as the ones offered by other companies on the market, this seems to be largely related to the lack of funding from the US and the low interest in upgrading foreign M1 Abrams tanks (due to the fact that most Abrams user's like Egypt, Iraq and Australia do not have the money for any tank upgrades). For the Scout-SV programme General Dynamics European Land Systems however had to rely quite a bit on other companies from this list: the turret for the Ajax is based on Rheinmetall's Lance Modular Turret System and at least partly manufactured in Germany, whereas Lockheed Martin UK has developed the fire control and reconnaissance systems for the Ajax. The upgraded Warrior using Rheinmetall's turret design as base is the best reference that LM can offer. Lockheed Martin plays a major in the Warrior capability sustainment programme (WCSP) and in the Ajax variant of the Scout-SV, but lacks any own vehicle designs. Instead LM mostly upgrades electronics and other sub-components of AFVs mostly. For the Scout-SV and the WCSP Lockheed Martin relied on turret technology supplied by Rheinmetall and technology/components supplied by other sub-contractors. Krauss-Maffei Wegmann (KMW) is currently the world market leader when it comes to tanks and thus should be considered a very safe bet. While on pure numbers the M1 Abrams and the T-90 have sold more units, this is often the case by allowing the local assembly of cheap, downgraded and subsidized versions (such as the M1A1 tanks for Egypt or Iraq and the T-90S tanks for India). KMW has shown the willingness to create local versions of the Leopard 2 and to allow local assembly. They also have shown intention to upgrade designs made by other companies (such as their bid to upgrade the Brazilian M113s). During the 1980s and early 1990s KMW developed a special tank based on the Leopard 2 tank for the Spanish Army. KMW could just as well "leopardize" the Challenger 2 by fitting the Challenger 2 with as many proven sub-system of the Leopard 2 as possible. Rheinmetall has seen increased success on the tank market, after starting to compete against KMW for Leopard 2 upgrades in 2010. They just recently managed to win a contract for the modernization of the Polish Leopard 2A4 tanks to a new Leopard 2PL standard. Rheinmetall has a wider variety of subsidaries and can probably, unlike pretty much any other contender, provide most technologies and components by themselves, without the need to hire a subcontractor. With the MBT Revolution upgrade, Rheinmetall does already offer a modular upgrade which in theory is designed to fit (with some adaption) to any tank. So maybe we can see some type of Challenger 2 Revolution? Leopard 2 Revolution prototype - will the CR2 soon look similar to this? CMI Defence is probably the least expected candidate for the Challenger 2 LEP tender. It never has produced or designed a complete AFV or even a major AFV upgrade. Instead CMI Defence is specialized on light-weight medium/large caliber guns (such as the series of Cockerill 90 mm guns or the Cockerill CV 105 gun) and making ammunition for these. However in the past years CMI has extended it's portfolio into the market of turrets and weapon stations. 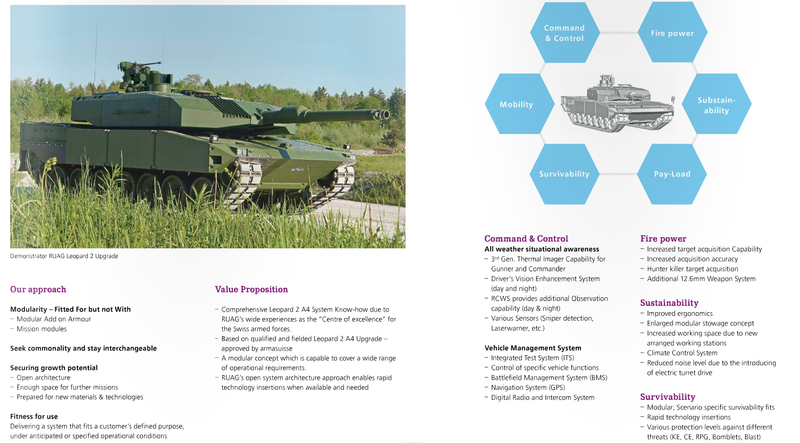 RUAG Defence of Switzerland has experience with the modernization of medium and heavy combat vehicles for the Swiss Army and several other export costumers. The Panzer 87WE upgrade for the Swiss Army was developed in cooperation with KMW, previously RUAG also upgraded the Swiss fleet of M109 howitzer. Other tank modernizations from RUAG include upgrades for the older Panzer 68 and cooperation with Jordan on the M60 Phoenix MBT prototype. In 2015 RUAG has managed to win a contract for upgrading Austrian and Belgian Pandur APCs. Currently RUAG is offering a Leopard 2A4 upgrade - does it work for CR2 aswell? In general it is unkown how the UK MoD wants the CR2 to be upgraded. It is understood that the scope of the upgrade is rather limited, as the budget is very tight. Replacing the gun is expensive, because the interior of the Challenger 2 MBT is not configured for storing long 120 mm unitary rounds. In case of the CR2 fitted with the German L/55 gun as prototype during the CLIP, there was only proper stowage space for a total of 6 rounds (!) of main gun ammunition. In theory only Rheinmetall and RUAG/CMI can offer a main gun replacement with their own technology. Rheinmetall has developed the Rh 120 L/44 and L/55 guns of the Leopard 2 MBT, aswell as a 105 mm smoothbore gun and the 120 mm L/47 LLR (lightweight, low-recoil) gun. RUAG has developed the 120 mm CTG (compact tank gun), which was designed with reduced recoil as a low-cost/low-modifcation upgrade option for various existing tanks. Jordan has tested this gun on a Challenger 1 tank, the M60 Phoenix upgrade prototype and on the Falcon-2 turret system, BAE used this gun for the CV-90/120 light tank and the Swiss Army trialed it on their Panzer 68 upgrade. Depending on required maximum recoil and muzzle break, the CTG has a length of 47 to 51 calibres. Will CMI or RUAG offer the CTG to the UK? However it is unclear wether RUAG or CMI could offer this gun to the British Army (even if they could afford major modifcations to the CR2 interior) - CMI has bought at least some rights of marketing the CTG to at least some markets. Maybe CMI bought the full rights, or RUAG and CMI agreed on both having full rights for this design. Another interesting concept, that however might as well be too expensive for the British Army, just as fitting a smoothbore, is the idea of mounting a new turret on a Challenger 2 hull. The turrets of the M1 Abrams and of the Leopard 2 can fit onto the turret ring of a Challemger 2 hull, but require some deeper modifications, which again could be too expensive for the British military. The M1 Abrams turret does not include most of the gun and turret drives, which are located in the tank's hull and are also hydraulic in the M1 Abrams. This is an important difference to the CR2 turret, which includes electric gun and turret drives. 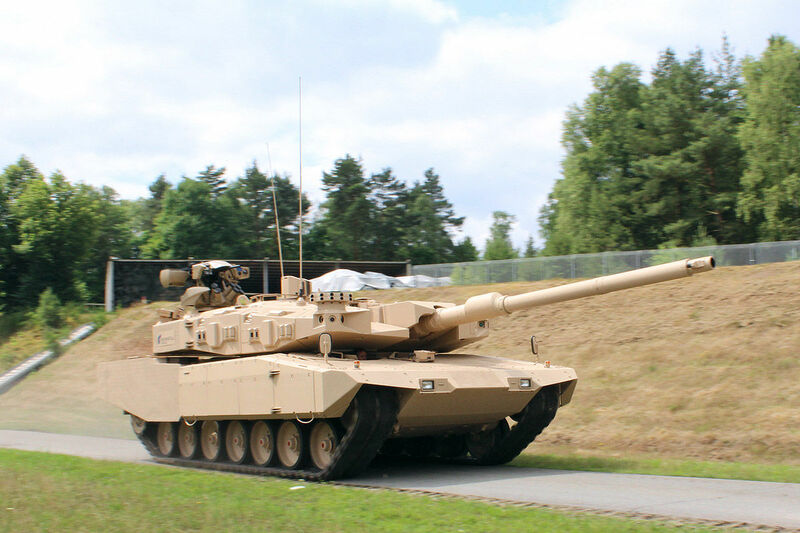 US trials have also revealed that upgunning the M1 Abrams with the longer L/55 gun of the Leopard 2A6 requires deeper modifications, which is why it was judged as being to expensive for the US Army. The big advantage of a M1 Abrams turret would be the rather large ammunition load of 34 or 36 rounds (depending on which racks are installed). The Leopard 2 turret has electrical drives housed in the turret, so that it would be easier to integrate onto a CR2 hull - however the Leopard 2 stores only 15 round main gun ammunition in the turret buslte, so that the CR2 hull would require modifications for storing further ammo. CMI is specialized on guns and turrets, so they could offer a version of their Cockerill XC-8 105-120HP turret fitted with a 120 mm smoothbore gun, if the turret rings are compatible. Problematic is in this case the different level of protection (CMI's turret is lacking thick composite armor) and the fact that the British Army might not like being forced to utilize an autoloader. According to Jane's IHS only two contenders will be shortlisted. I'd bet that this will be BAE and either General Dynamics or Lockheed Martin - simply because they have the best position in British politics and they have manufacturing facilities in the UK. The UK government was willing to increase the price tag for their Scout-SV programme by several millions, just to move the manufacturing site from Spain to Wales. In terms of technology, I'd choose Rheinmetall, General Dynamics or KMW however. Unlike BAE these companies have state-of-the-art products available and do not make most of their living from old 1980s designs such as the Warrior or Bradley. Compared to CMI and Lockheed Martin, all of these companies do have manufacturing capabilities for deeper modifications and upgrades. RUAG is probably comparable, but lacks a wider portfolio and as many successfull contracts as Rheinmetall/KMW/GD. Probably the Challenger 2 LEP will end up being only a minor improvment due to budget cuts. Some new ammunition maybe, an improved fire control system, a new APU and maybe some other digital stuff. Well my first thought was that they will "just" change the turret, with one of the mentioned MBTs from another nation, due like you said it would make sense, since the CR2 design is different to the rest of the western MBT's . What i could see is CMI+Rheinmetall working together, as the offered products might be interesting enough to do a Joint Venture on this. I don't think CMI and Rheinmetall would want to work together. Rheinmetall has a lot of experience building/modernizing turrets themselves, so they are probably more interested in doing as much as they can by themselves, so they get more money.